Contents: 1 game board, 1 depot board, 5 player trays, 46 action disks (28x gray, 18x red), 25 bonus cards, 32 barter cards,1 starting player fire marker, 1 mammoth tooth, 1 Honga play figure, 30 mammoths, 5 prehistoric humanscavemen, 5 scoring markers, 20 raw food material markers (5x fish, 5x berry, 5x mushroom, 5x drop of water), 1 set of instructions. Short game instructions: • Set up the game according to the game instructions. • Place an action disk on one of the 4 round spaces. 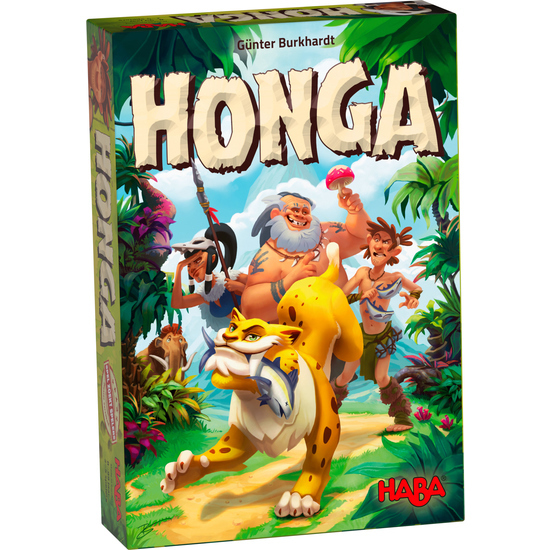 Be sure to try to please Honga, if you can't, then he moves to your tableau and will continue to eat your supplies. • Carry out the selected actions with the action disk (collect food, attract mammoths, worship gods, etc. ), and, if necessary, use a maximum of 2 bonus cards. Actions and bonus cards give you victory points. • Draw a new action disk. You can draw red action disks if you have the mammoth tooth. • The person who has the most victory points at the end wins the game.